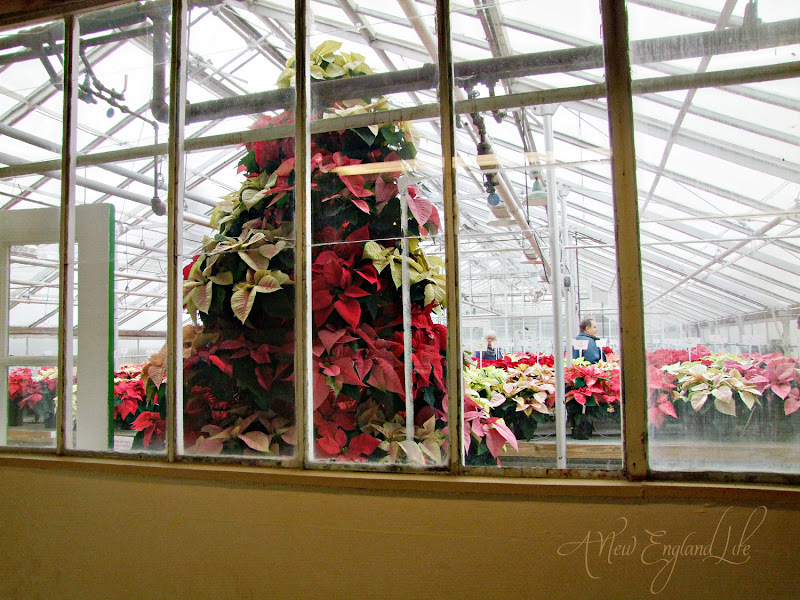 On Saturday morning I went to a Poinsettia Open House at UNH. There were 102 different varieties of plants! 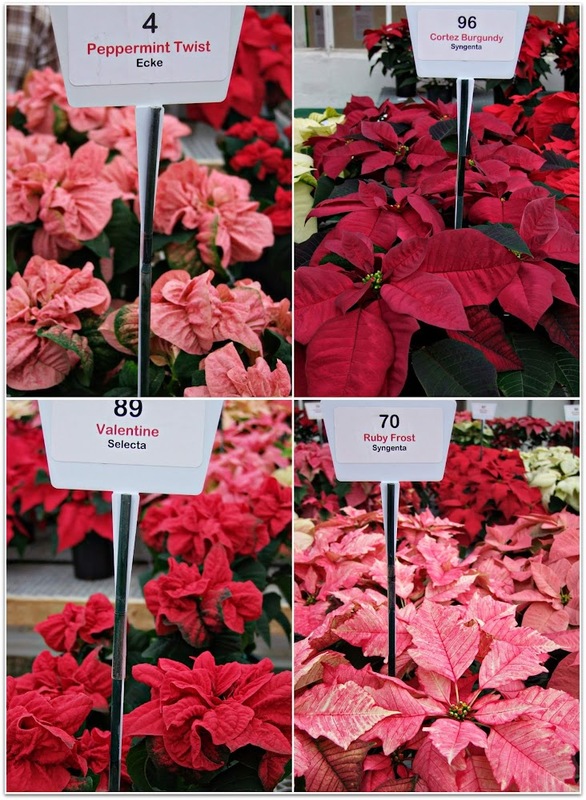 One section of the greenhouse had plants for sale but the majority of the Poinsettia's were strictly for observing and judging. I didn't judge, I observed. And photographed. 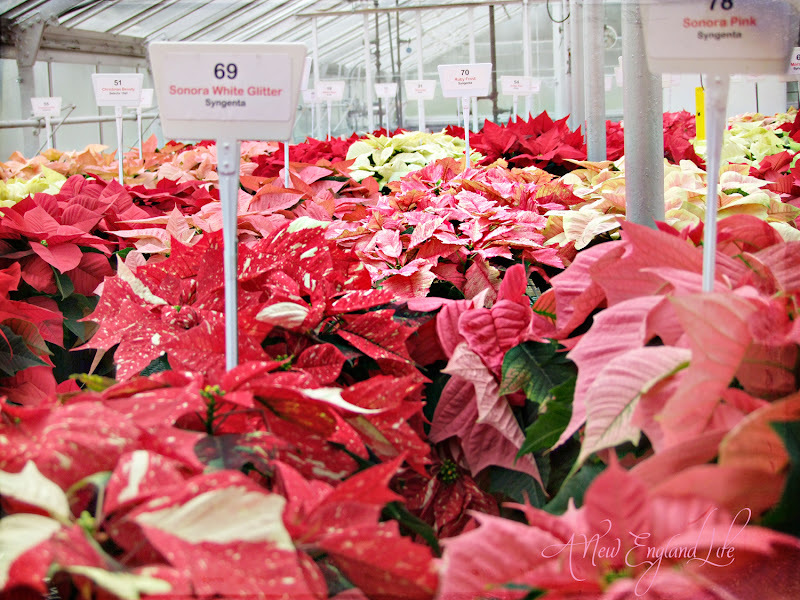 There were actually 2 different greenhouses and a long entryway filled with hundreds of Poinsettia's. It was a nice way to spend an hour or so, just browsing amongst the gorgeous colors of salmon, red, burgundy, pinks, roses, whites, and everything in between. I spoke with the professor and he said the new varieties are genetically made in Mexico. From there the cuttings are sent up to the United States to big rooting companies. The rooting companies choose only the best and most hardy varieties to keep producing. Overall it is a very long process and can take years for one single variety. Many of the varieties on display will never be seen at your own local greenhouse because they are too difficult and time consuming to grow. The greenhouse's could never make a profit. New varieties ARE making their way onto the market though. We just bought a red and white speckled Poinsettia at the local grocery store. I liked that it was a bit different looking. I liked the deep red of the Cortez Burgundy. There were some orange Poinsettia's too but I didn't think they were very appealing. Sonora White Glitter looks just like the plant I bought. I took a LOT of pictures so trying to choose which ones I liked best was a challenge. Thank you for visiting. Lately I'm trying to post photo's that are a little different than what I normally post. Other blogs have been inspiring me to look at my images a bit differently. I also am enjoying photos with color! This is such a blah time of year now that all the leaves have fallen but I'm determined to look outside the box. Of course I won't always hit the mark but for right now I'm liking the end results. I hope you do too! I also wanted to thank all of you who left such heartwarming words on my post titled: At Rest. Sometimes I feel pressured (by myself) to blog more often but then I tell myself, you can only do what you can do. Anymore than that and it won't be true to who I am. This is beautiful. One of our neighborhood nurseries here does this with pumpkins in October. Sharon, What a treat that must have been. Gorgeous!! 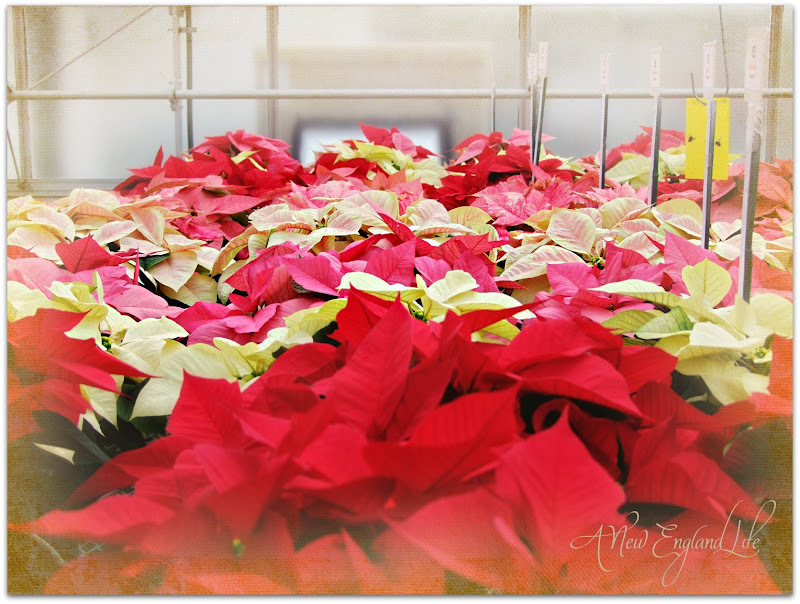 You can't go wrong when posting photos of poinsettias. They just bring a smile to everyone's face. Love these plants. Last year we were the recipient of a huge pot of them. It cheered me for a long time. Yes, dreary right now but there's color to be found. And this really hit the spot. 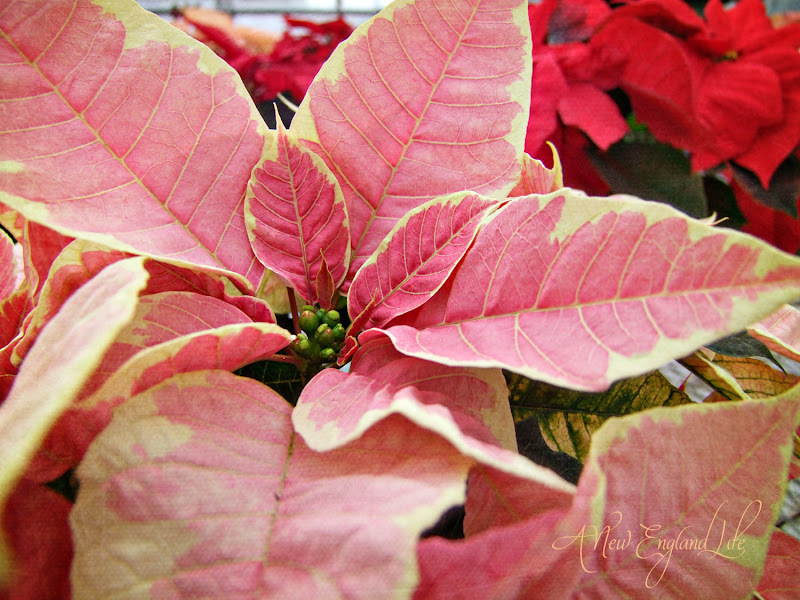 I love the sea of colour in your poinsettia pictures! Beautiful! I always like your photos and enjoy your little side trips to the seaside and small New England towns. It's nice to offer some variety too. Keep on sharing. Your photos are always such a lift! Thank you so much! Gorgeous! I'm heading to my favorite Nursery to get a view of theirs...can't wait! Thanks for sharing such beautiful flowers and photos! It must have been a treat to see such beauty and color amassed together all in one place. Lovely - I am excited, now I can get some and not worry about my cats. Wonderful photos. Sharon, thanks for sharing the photo's. I put the date and event on my calendar for next year. I would have loved to see it. Wonderful photos! Sounds like a great way to spend an hour or so, thanks for taking us along on your trip! I love the ruffled poinsettias - perhaps we'll see those up here sometime. A day such as you shared is unique to this time of year - aren't you glad you went? I am! Beautiful shots and I love the variety of colors. Definitely a feast for the eyes! Such a TREAT! Thank you so much for your wonderful photos. I always like what you choose to share with us. I love the Christmas tree made up of poinsettias! Who knew there were so many different kinds? They are indeed a beautiful flower; too bad they don't give off a smell! BTW, you've NEVER had a "bad" photo! Very pretty! I think this poinsettia christmas tree is awesome!! Ooo la la...i knew when you said you were going to this event that you would come back with some beautiful photos! Very cool varieties! I love the Ruby Frost! Very lush colours -adn beautiful plants! 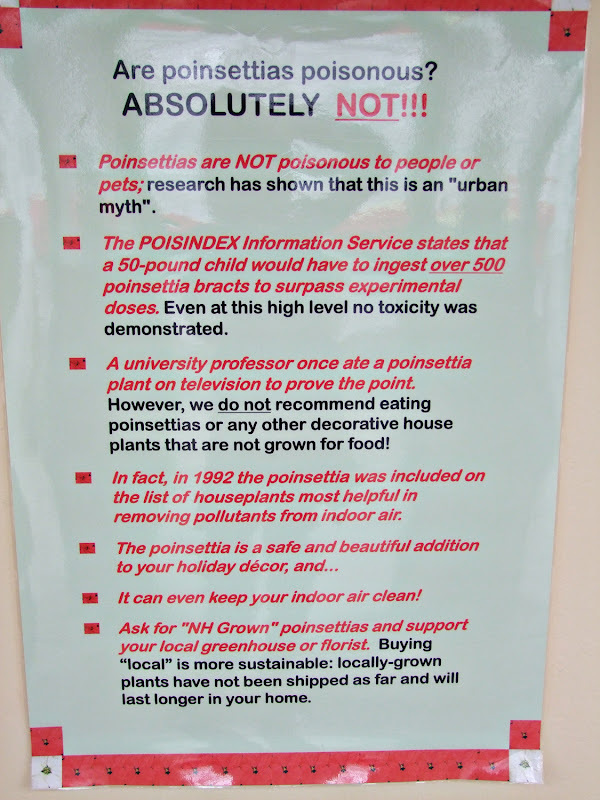 I also thought Poinsettia's were poisonous -so thanks for that! it's fun seeing the new varieties from the leading breeders. I think most ppl have no idea the work that goes into a crop like these so thanks for pointing that out and a big thanks for the urban myth about them being posionous. I had saved an article about the origin of it but of course I don't have it anymore. Sounds like you had fun touring! ps I think all your photos are amazing! I think I tend towards the dark red ones too Sharon. Pink just does not feel Christmasy to me? Lovely way to spend an afternoon. Beautiful shots! I have never particularly liked pointsettias but WOW, these are beautiful! Love the new color shots. That pointsettia tree is really something! Poor Lily! Hope she feels better soon. 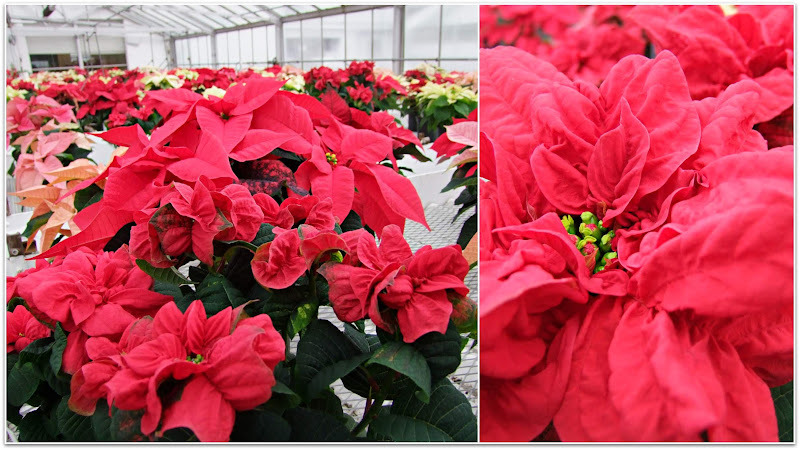 Great pictures of the the poinsettias. A very nice way to spend a hour or two. Absolutely gorgeous! I love the Peppermint Twist! And I thought of you tonight as I picked up my Christmas present - your horse photo framed. Can't wait to show it to you! 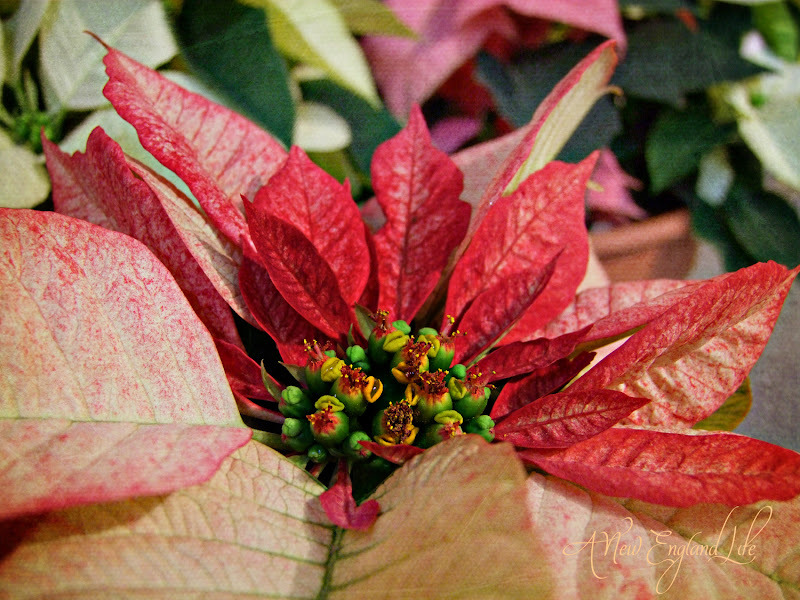 Love the poinsettias--who ever thought there are so many different varieties, but most of all, thanks for the beautiful photo in the banner of The Nubble. We've only experienced it in the summer (every summer!) so thanks for the winter perspective. I had no idea there were so many varieties! Some of them are beautiful, and others are simply odd. It is good to know that people are working on the new varieties, though! 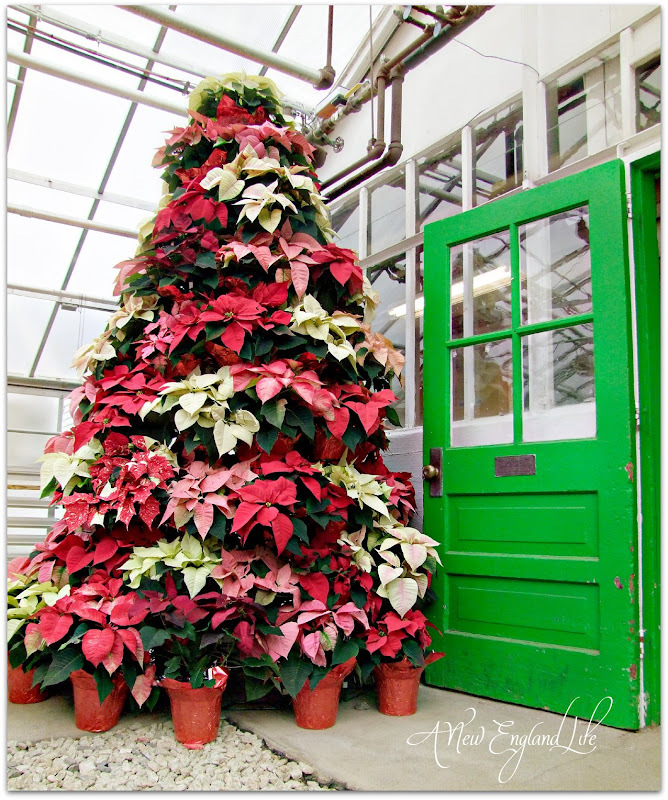 I LOVE that poinsettia Christmas tree! What a wonderful, creative way to use poinsettias. Such beautiful poinsettias. I forgot to buy one this year for the house and I only have my fake one on the table.